Auto Skunk 47 from Advanced Seeds is an autoflower weed strain that is originated by crossing the Auto Critical Mass x Auto Kaya 47. 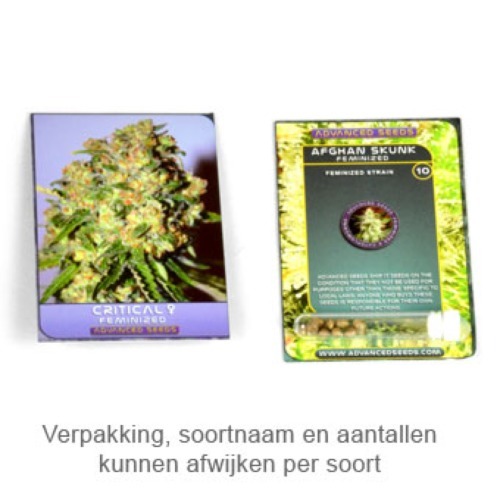 This powerful strain is delivered as feminised cannabis seeds. Advanced Seeds Auto Skunk 47 are weed seeds that are appropriate for an indoor grow and outdoor grow. These plants have nice branches and produce a good yield. Smoking this weed gives you physical a very relaxed feeling that persists for a long time. This autoflower weed strain is frequently used as medical cannabis seeds. She has a powerful sweet fruit flavor where you can even recognize an element of peach. Growing cannabis from these feminised autoflowering seeds provide you a delicious and good yield. Tell us and our customers what you think of the Auto Skunk 47 from Advanced Seeds.